Big changes are coming to Port Columbus International Airport. Not only did Southwest airlines recently name Columbus a focus city and announced non-stop flight service to the San Francisco Bay area, in addition to adding flights to Boston, Atlanta and D.C., but the airport is also about two-thirds of the way through an $80 million renovation project. Concourses A and C are finished with their renovations that now show modernized elements such as terrazzo flooring, enhanced lighting, new ceilings and carpeting, tile wainscoting and new, more user-friendly restrooms. 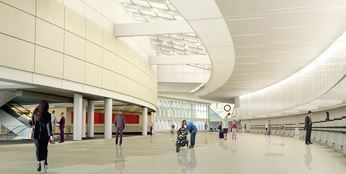 Currently, Concourse B is going through the re-model phase and will wrap up this summer to fully mirror Concourses A and C.
As Concourse B is wrapping up, Baggage Claim renovations have begun to completely modernize the restrooms, enhance natural lighting and update architectural elements such as column wraps, among other things. Baggage Claim updates are scheduled to only take a few months, wrapping up in Nov. 2015. 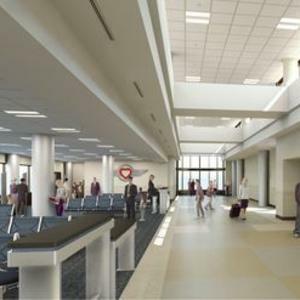 The Ticket Lobby modernization is highly visible to the public as the airport is getting ready for new major features to include skylights and huge window walls. Ticket lobby renovations are slated to finish in March 2016. In early 2016, the terminal modernization will be completed to reflect the energy and vibrancy of our great city. The efforts being made to modernize Port Columbus are designed to increase efficiency and to enhance the many aspects of the travelers experience. You can stay up-to-date with all of the changes and timelines for the Terminal Modernization Program here.